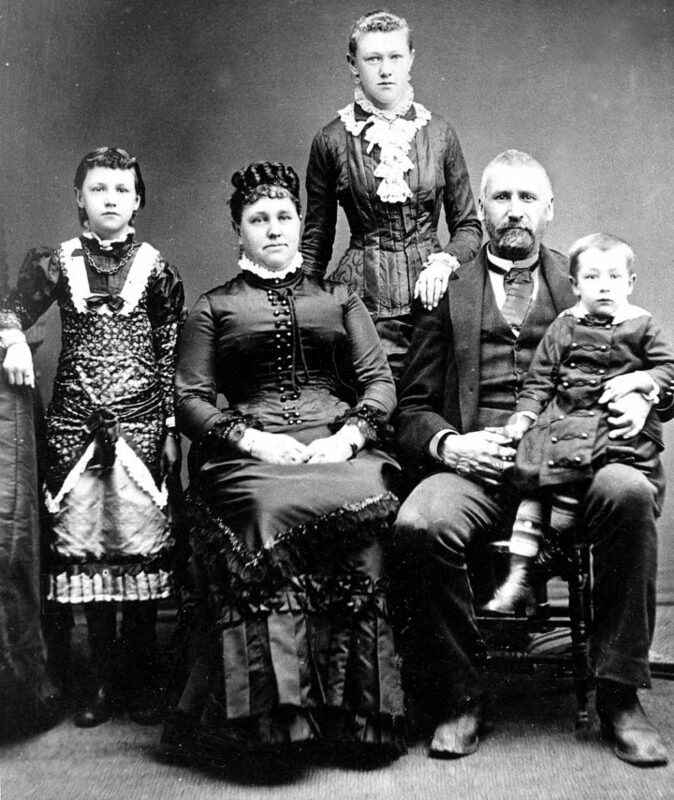 ABOVE: Ferguson Family Portrait, c.1890. From the left: Ivy Maude, born 1875, Lucetta, Sylvia M., born 1869, Emory Canda, with son Cecil, born 1881, on his lap. Taken around the time the family moved into their new home, a mansion, located on the site of Snohomish Aquatic Center. All images courtesy Ferguson Family | Snohomish Historical Society Archives. Our story about the founding family of Snohomish began last month with a photograph taken by Ivy Ferguson of her family home. It was under construction in 1889, and it’s possible that this month’s studio portrait of the Ferguson family was taken to celebrate the move into their grand new residence . Let’s imagine we are going to call on the family to pay our respects and offer our congratulations on their new home. 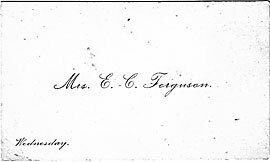 First, we need to check Mrs. E. C. Ferguson’s calling card to confirm that “Wednesday” is in the lower left hand corner – this is the day the lady of the house receives visitors. Next, we will need to rent a horse and carriage, assuming we don’t own our own rig, since the home is too far out of town to walk with any dignity remaining once we arrived. The oldest livery in town is Knapp and Hinkley’s on 2nd, but who among us knows how to a handle a horse and buggy? 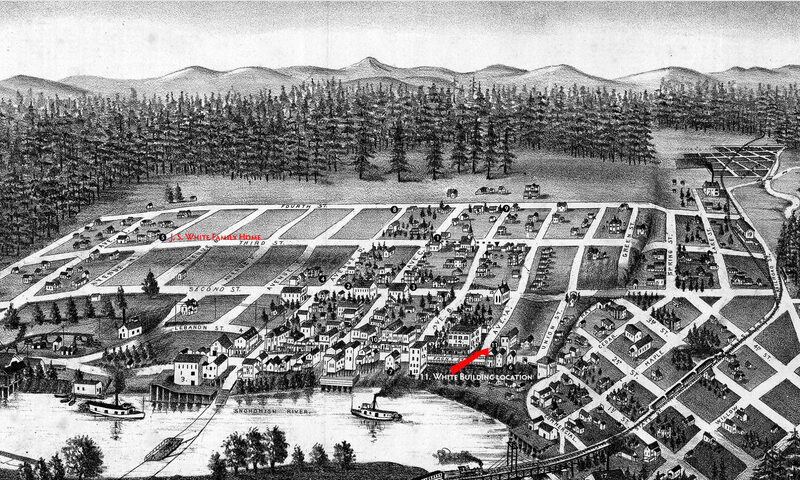 Chris Gee, president of the our historical society has the equestrian skills required, and with a little faith in time travel, we arrive at the Ferguson Mansion, north of town where the Snohomish Aquatic Center will be built in a 118 years. Eldest daughter, Sylvia, greets us at the door. She is quite tall, with piercing eyes and a slow, knowing smile lights up her face as she scans our strange clothes. Sylvia thinks a lot about the future. The gossip around town is that her father is footing the bill for her journey to Hawaii, a destination made popular by Mark Twain’s book “Roughing It in the Sandwich Islands, Hawaii in the 1860’s.” Sylvia attended the Territorial University in Seattle, studying the Classics, and is comfortably self-possessed. Her mother, Lucetta, is playing the piano, loudly, a tune we don’t recognize of course, but she stops immediately and stands to greet us, making us feel very welcome. Seated in the front room, we try to follow her plans for more furnishings, since the room seemed stuffed to our modern eyes, but we are fortunately interrupted by Ivy who has entered with a tray of tea cups, pot and a plate of really tiny cakes. 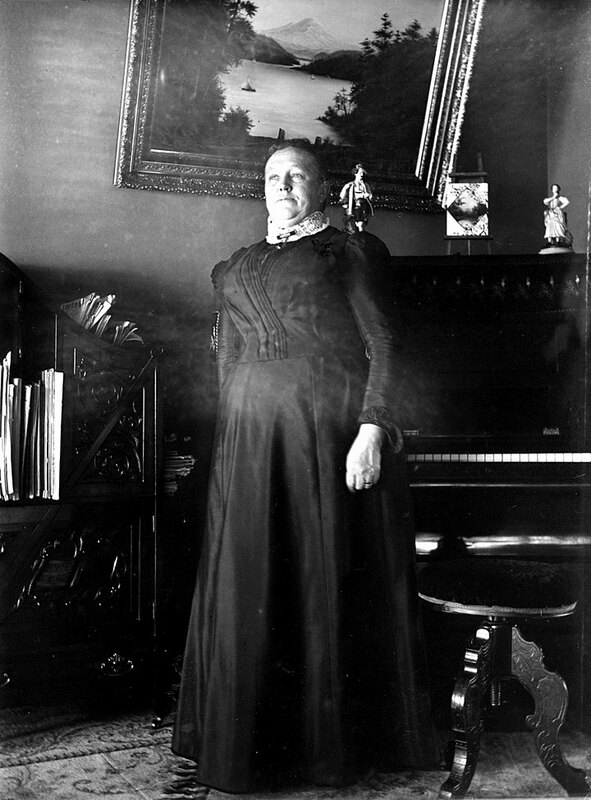 Lucetta was born in Iowa to Mary Jane (Trout) and Hiram D. Morgan. By the time Lucetta Gertrude Morgan turned 11, the family was living in Olympia Washington Territory. Eight years later, she met Emory Ferguson during his service as a legislator. What a lucky break for both seasoned pioneers. An eligible woman from hardy stock meets the founder of his own town who now wants to found a family. They were joined in marriage, July 11, 1868, at the home of her parents in Thurston County. “And I was born 13 months later,” announces Sylvia, stopping the conversation cold.